Stephen: I’m a big fan of the blog. Are you surprised with the enthusiastic reception you’re getting? Danny: I’m surprised that anybody reads it at all. My original plan was zero readers, that I would just do this for four years and no one would care. But no, I love doing it, obviously, and that people are commenting so much. I’ve been thinking about doing a post like this with you for a while, because it feels like you’re writing your own blog, in the comments of my blog. Stephen: Yeah, since I’m watching the show anyway. Danny: There’s a thing that happens in the comments — not just with you, but with you a lot — where you’ll say, “Well, the most interesting thing that happened in this episode was…” and it was something that I didn’t even notice. So obviously then I have to bring that up in the next day’s post, like I’m a genius and I was totally planning to do that the whole time. Stephen: Well, I’m thrilled that you’ve reached this period of the show. In the past, when people have said I’m going to do a blog, or a podcast, they never get to Quentin and 1897. So I’m pleased that you hung in there, and didn’t get bored or hit by a car. Danny: Oh, you have no idea how careful I am when I cross the street now. It’s a huge responsibility. Danny: So one thing that’s come up recently on the show — and you and I have been super excited about this idea — is that the show has become more explicitly theatrical. I noticed two weeks ago that Count Petofi is always talking directly to the audience, and basically we haven’t talked about anything else since then. Stephen: WeIl, I think that’s why Alexandra Moltke’s departure from the show was such a major change. Because it’s so theatrical now, and she was not a theatrical actress. Stephen: She’s more black and white, soft focus, tight close-up. Danny: And then she does a little facial expression. Stephen: Yeah. And now Nancy Barrett is a crazy Cockney showgirl, and every character is insane. By the way, there’s one thing about this episode we’re going to watch — since you mentioned it the other day, I can’t un-see the sport coat that King Johnny wears. Danny: I know! Even under the cape. Danny: They’re having a lot of trouble figuring out what gypsies look like, and sound like, and how they dress. Magda and Sandor were in sync, but even when they bring Jenny back into the show as a ghost, she still doesn’t look like a gypsy. That was their opportunity to rebrand Jenny, and they didn’t do it. Stephen: My theory is that gypsies, being the show’s only obviously ethnic group, and the way that other characters talk about their pagan religion — it’s a commentary about how WASPs view Jews. Danny: Like, they’re kind of fun, but we don’t really understand why they have to act like that. Stephen: And Jenny, when she comes back, it’s like, she’s in heaven now! She’s dressed normally, her hair is beautiful — she’s sane! She’s not a gypsy anymore! Stephen: Yeah, she’s a blonde slave from Martinique. Andre makes all his money on a sugar plantation; obviously, he’s a slave owner. And she never even made sense as a maid, because Lara Parker is so elegant. When she stands next to Maggie Evans, you wonder, “Which one is the rich girl, again?” But when she’s introduced here in 1897, and she comes out of the fireplace, with the eyes and everything — she’s just otherworldly. She’s demonic nobility. That’s the version of Angelique that I love. Danny: So how did you first get into Dark Shadows? Stephen: My mother was of the generation who watched it as a kid. I was 14 when I discovered that my mother likes a vampire soap opera. So we’re watching the Jason McGuire stuff, and she’s telling me, “Just wait until Angelique shows up!” I have very fond memories of watching the series with her. Danny: Oh, that’s very sweet. What channel was it on, was this PBS or Sci Fi? Stephen: When I first saw it, it was on an independent station, a FOX affiliate that would run it at 7:00. I never saw anything after the first syndication package, up through 1795. And then in college, Sci Fi Channel started showing it. Danny: And then you had to start over again. Stephen: Yeah, they decided to start with episode 1, which was bizarre — we’re the Sci Fi Channel, and we’re going to show something that is completely not sci fi, for a year. This is on between The Time Tunnel and Doctor Who, and everybody’s talking about a pen. Danny: Well, they didn’t have anything else at the time. When the Sci Fi Channel first started, this was one of their big gets. They couldn’t get the rights for Star Trek, which should have been their big tentpole, so they were really excited to have Doctor Who and Dark Shadows, because those are two shows that at least somebody likes. 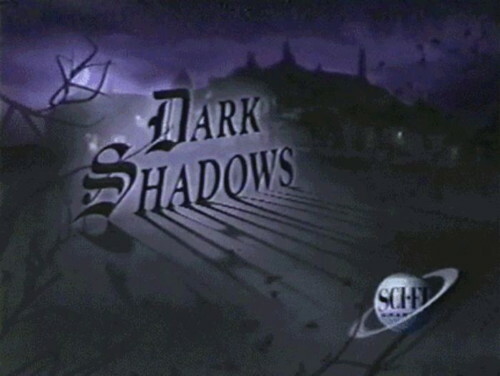 Like, we have The Time Tunnel, and Lost in Space, and Fireball XL-5… Dark Shadows had a fan base. But yeah, such an odd choice to start with 1966. 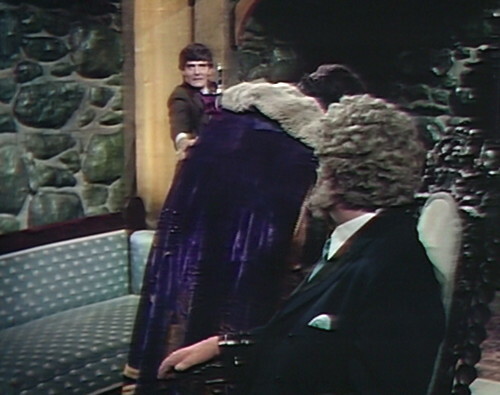 Stephen: Well, there’s a myth about Dark Shadows, that it can only be consumed in this one way. Danny: There’s a Netflix generation now, people who grew up in a world with DVDs. When I watched TV as a kid — all the way through college, really — you just watched whatever Simpsons episode was on. You didn’t go back to the first episode, because you literally couldn’t, it wasn’t on the air. I started watching Buffy the Vampire Slayer from the last episode of season 2, and I watched the whole rest of the show before I got to see the beginning, because that was the way you watched television. Stephen: Right. And that’s a good segue to actually watching today’s episode. Danny: Oh, yeah. We should probably do that. This is going to be a long post, because neither of us can actually stop talking. For one hundred years, Count Petofi has wandered the world, seeking the Hand the gypsies took from him. But now the triumph he felt in finding it has turned to terror, for the gypsy king has tracked him down — a nd with all his dealing in the dark spirits, for all his powers — Petofi knows that he is facing the one man in the world over whom he is powerless. Danny: They’re not explaining where we are anymore. Stephen: He looks great in the purple cape. I want an outfit like that for when I execute people. It’s like what Liberace and Elvis would later wear, when they’d go onstage and cut off people’s hands. Danny: This is now a show that’s entirely about the villains. The exciting cliffhanger here is: does this villain kill the other villain. Stephen: Right, because we don’t want something to happen to Count Petofi. He’s more interesting than anyone else on the show. Danny: And then Aristede appears, and throws a knife into Johnny’s back, which is super satisfying. Hooray! Another villain saves the day. Stephen: Aristede and Petofi have a relationship that feels very genuine. It’s like Goodfellas. These are guys who like each other — sure, they’re evil, they’ll betray each other — but it’s a genuine friendship. They have fun. Danny: They do. Aristede enjoys his job; he’s having a whale of a time. Danny: Aw, pulling the prop knife out of his back is so cute. Stephen: And he just wipes it on the cape! Danny: Oh, that’s rude. It’s such a nice outfit, too. 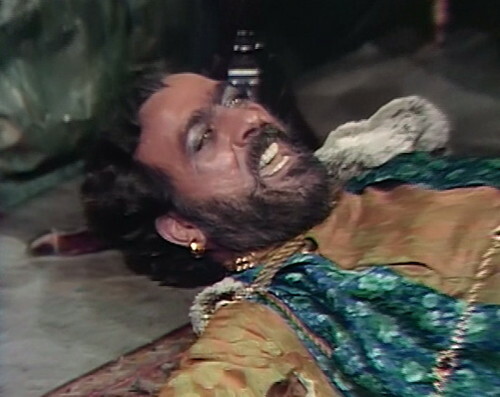 Petofi: You are dying, King Johnny, and I will kill all of your tribe that cross my path! They must learn to leave me alone! They must learn to give me peace. Stephen: Note that this is a Violet Welles script, so it’s going to be great. Danny: Right. Even if nothing happens, they’re going to say awesome things to each other. King Johnny: You kill King Johnny, you think you are safe? Think again! Nine days after my spirit leaves the earth — nine days, I will return! — and give the power to another gypsy, somewhere. He will then have the power to kill you! Danny: I haven’t written on the blog yet about Vietnam, because I haven’t found a way that it connects. But this might actually be the Vietnam moment, where there’s a completely senseless conflict going on between Petofi and the gypsies. Now he’s cursing Petofi again, because now he’s killed another gypsy. Stephen: Yeah, they’ve been fighting each other for so long, they’ve forgotten why they’re even at war. Danny: And this conflict really has nothing to do with Dark Shadows. Danny: It’s this endless war that started way before, and it’s not connected to any character that we’ve ever cared about. We’ve intruded on someone else’s territory, someone else’s war, and suddenly it’s our problem, and we’re stuck in this terrible situation. Stephen: And we’re not watching people who are upset because they went to jail on a manslaughter charge. Stephen: The show is so big now! When they started, the issues were so small, compared to how epic and operatic it is now. Petofi: You have killed one gypsy. I have killed hundreds, in my time. In spite of all their curses, I have dined well, slept well, and dreamt no desperate dreams. Stephen: It’s like a Nazi talking about the animals and the master race. Danny: Yeah, it was gypsies and Jews, like you were saying before. Those were the two subhuman races for the Nazis. Stephen: But it’s very coded. This is stuff that you wouldn’t say about Jews on a TV show, or about black people, because it wouldn’t be polite. So they’re dealing with it in this Twilight Zone manner, where you’re able to explore this stuff, because you’re not in the real world anymore. Danny: And gypsies aren’t real anyway. They’re like elves. Danny: Hooray! Here’s Quentin. So he’s taking care of Jamison, who thinks that he’s his own grandson David, who’s dying — sorry, he will be dying, at some point seventy years from now — and therefore Jamison is dying. This makes all the sense. Stephen: It’s a beautiful moment, though, and Selby is awesome. The connection that these two have basically rewrites everything that we saw in the haunting of Collinwood. The idea that that ghost was in any way motivated by love — what we saw didn’t feel like that at all. But it’s totally shifted now, to the idea that this was all driven by his love of Jamison. Quentin: Then the sealed room — that’s my room! And the skeleton is my skeleton! Danny: The possession idea is aggressively ridiculous — but we forgive it, because it lets Quentin come into contact with the ghost that he’s going to be. “Our Quentin” finds out what he was, and what he did. Stephen: And this marginalizes Barnabas completely. 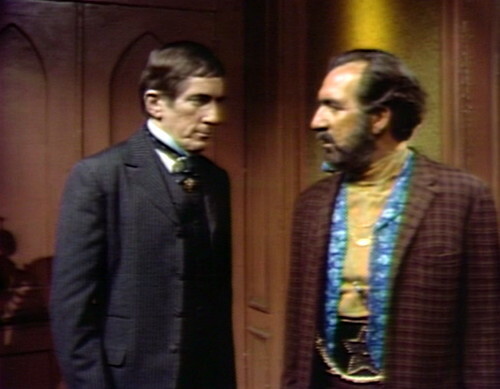 The only value Barnabas had in this story was that he knew about what happened in 1969. Now Quentin knows, and he’s personally invested in fixing this situation, for his own sake — as opposed to Barnabas, who really only cares for theoretical future reasons. 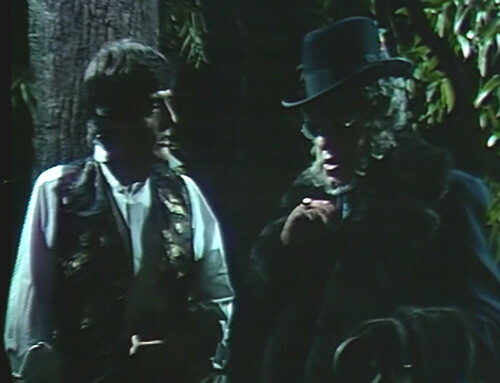 Danny: And Barnabas has been kind of hapless all this time, not sure what he’s supposed to do. Quentin is actually the one who’s qualified to solve this problem. Stephen: Right, it’s his family, it’s his world. Quentin (thinks): And I’m so frightened, to know that in 1969, Quentin Collins will be a skeleton in a sealed-up room. A ghost, terrorizing a small boy! Driving people from Collinwood! Stephen: Because that seems very unlike what I would do now. This is very meta, an acknowledgement that they’ve completely rebooted the character. I wouldn’t do those things! I’m on bubble gum cards. I wouldn’t set a kid’s arm on fire. Danny: No! Why would I? Stephen: I’d kill Abe Vigoda, because that’s hilarious. I’d still do that. Danny: Well, obviously, right. How do you not? Stephen: That’s the first truly Quentin moment in the series, I think, the ghost sneaking up behind Abe Vigoda and killing him, because it’s funny. Quentin: I didn’t know that you had been in Collinwood, in David Collins’ time. Angelique: Another time, another name… Yes, I was there. Or should I say, I will be there. Before you arrive, however. Stephen: It’s like Steven Moffat’s Doctor Who. On Doctor Who, time travel was just a vehicle to tell a story, but a lot of modern Who is about what time travel means. 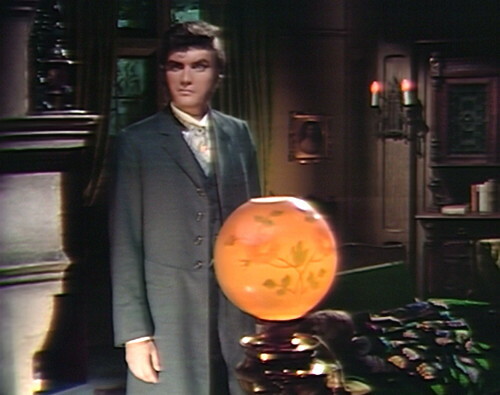 Danny: And at this point, Dark Shadows becomes a time travel show. It used to be a completely different show that included a little time travel. Now, it’s the only thing the characters talk about. Danny: And Angelique’s experience of time is clearly not linear. Her consciousness has jumped around exactly in sync with the audience’s experience. She was in 1795, and then in 1968 as Cassandra, and then back in 1795 again somehow, and now 1897. And she remembers it in that order, she knows exactly what the audience knows. Stephen: And that’s what just happened to Quentin, too. Now that he knows about the ghost. That’s the moment of, okay, we’re now in sync with Quentin. Danny: It’s so funny to me, when people try to come up with explanations for some time travel continuity problem. It’s like trying to explain why nobody notices that there are boom mics hanging above them. You can’t explain these things logically; that’s not the medium that you’re interacting with. Angelique: The spells on Jamison and Edward are very powerful. I have strong powers, too — but I don’t know if they’re strong enough. It’s far easier to cast a spell than to remove one. Danny: Angelique is the contractor who comes in to do an estimate, and she’s trying to manage expectations. Oh man, this is going to be a big job. Petofi: Yes, this place will do very well. You may start digging, Aristede. Aristede: I’m exhausted, from bringing him here! Petofi: I should hate to take the chance of his being found, because of your aversion to physical labor! Aristede: You know, I find it a lot easier to kill someone than to bury them. Danny: So within a minute of each other, Angelique and Aristede are both complaining about how hard their job is. 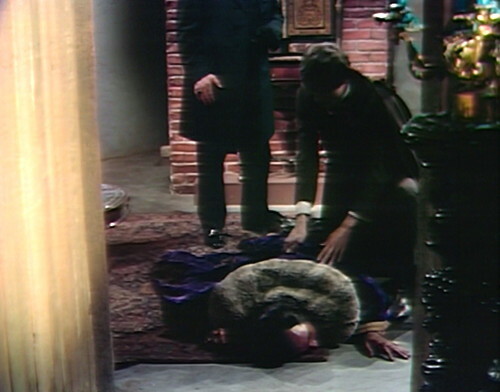 Now I have to dig the grave, and it’s so hard to remove a spell… This is clearly written by people who suddenly have to write the script for House of Dark Shadows, and the worst thing they can imagine is having more stuff to do. Danny: Everyone is so stressed out right now! Stephen: Oh, this is such a cool moment, when Petofi hears Angelique’s theme music, and he understands that she’s working against him, because he can hear the soundtrack. Danny: Yeah, only the most powerful characters have access to the sound effects. Petofi is definitely aware that he’s on a television show that’s being shot at ABC Studio 16. He’s looking at the camera the whole time, because he’s the only character who understands that he’s on a set. Everyone else is in denial about it. Petofi: I must go to Collinwood at once. Aristede: I’ll go with you. Petofi: No! You go back to the old mill, you must destroy the golden scimitar! Danny: Ugh, and that’s one more thing that Aristede has to go and do. They keep adding stuff on his to-do list. Stephen: It’s tough on the gypsies too, trying to get the Hand. They could just say, you know, this isn’t worth the hassle anymore. The weird idea of giving Petofi a hundred years to get the Hand back — it’s just asking him to kill a lot of gypsies. Danny: Right. And King Johnny said that nine days later there’s going to be another gypsy who gets the Vampire Slayer power. So now we have this schedule of every nine days, we’re going to come at you. Just another deadline for the endlessly overburdened cast of Dark Shadows. Stephen: So Angelique is casting the spell, trying to save Jamison’s life — and again, there’s no good guy. The kid’s in danger, there’s no Julia, there’s no Dr. Woodard. It’s just the demon from Hell. She’s the only one who can save this innocent child. Danny: And then she stops, because she can sense that Count Petofi is downstairs. Man on the land! Stephen: And Petofi storms in, and basically tries to seduce Quentin. Petofi: Your future could be brighter, and far more expansive than you have ever dreamt. If you could come over to my camp — let me develop those talents I perceived in you. Great talents, rare talents! Petofi: For evil, my dear boy. Pure evil. Danny: Asking him to come over to the dark side. 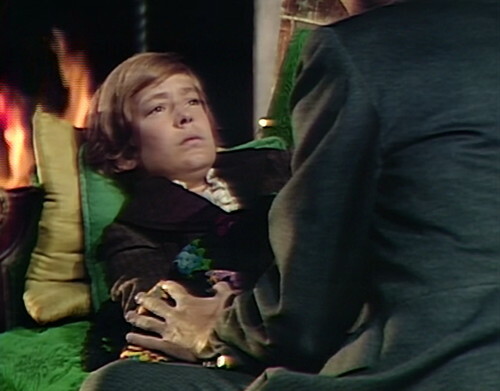 Stephen: Quentin is obviously the new star, because all Petofi wants to do with Barnabas is kill him. Danny: Right, but with Quentin, he wants to seduce him. Stephen: And Quentin could be evil, we’ve seen him be evil. So the idea of the fight for his soul is really compelling. It’s what we didn’t see with Nicholas and Adam, because Adam was just so stupid. Danny: Right, this is Quentin actually making a choice, in a way that Adam never consciously did. Danny: And they have a litter of demon babies. Jamison: Quentin… why did you ask me about the telephone? You know about the telephone! Amy used to talk to you! Danny: David is having a fridge logic moment, like: Wait a minute! My storyline doesn’t make sense! Stephen: Yeah, you’re asking how we met? Really? Why do we have to go over that? Danny: You know, I just realized that Jamison isn’t just being possessed by David — this is David at a very specific point in his life. It would be funny if Petofi would overshoot and get sullen teenager David, who thinks Quentin is stupid and he wants to smoke pot. Danny: Aristede is hunting for the scimitar, and he’s doing the awesome television version of looking for something, where you pick up a vase, like, maybe it’s under here! A scimitar is a big piece of equipment. Stephen: You’re the weapons expert on this team; you know how big this thing is! Danny: And then he goes and tries all the pockets of all the coats in the house. Stephen: This is a very well-decorated murder dungeon that they’ve set up. Angelique: Tell me who you are! Jamison: My name is David! Danny: Okay, Stephen, the big question for the end of the episode: Who is he? You get three guesses. I’ll give you a hint — he’s not a vegetable or a mineral. Danny: Although why he’s on the brink of death is super unclear. Stephen: Yeah, that was never — when Barnabas left in 1969, there was the idea that David could be dead by morning, but he’s really dragging it out. Danny: And David’s been here for two weeks. He’s not dying, he’s tired. He’s like everybody else on the show, just overwhelmed by all the stuff he has to do. Stephen: He’s at least a year behind at school. Danny: Oh, and he missed the moon landing! He’s going to be really pissed. Danny: Because we’re obsessed with it. Stephen: Well, it explains a lot about why the show works. 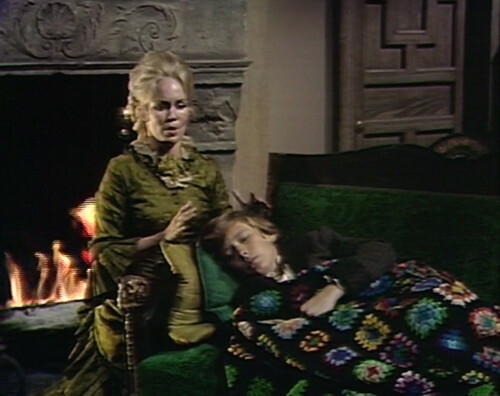 They have this kind of intimacy, the idea that the only people in Collinwood right now are Quentin and Angelique and Jamison, just screaming and acting crazy in a parlor somewhere. There’s no sense of them trying to explain where the servants are. Danny: Yeah, they can have these intense conversations in the drawing room about how I want you to turn evil, and nobody else — Nora isn’t coming in because she wants to watch TV. Stephen: Right, because Nora only exists if it’s relevant to the plot. It’s Dark Shadows logic, and it only works in this theater setting, because after you’ve watched the show for a while, you’re, like, those actors just didn’t come to work today. Danny: Yeah, only six people get to exist a day. 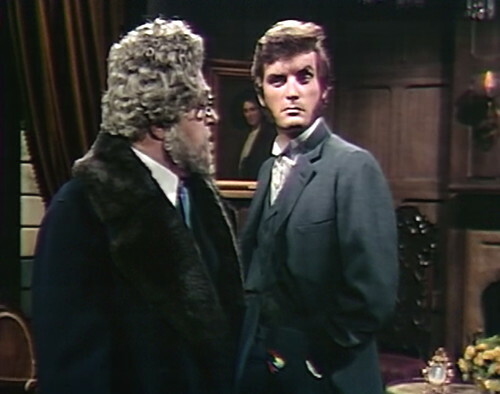 Stephen: And Barnabas doesn’t immediately come over and say, hey Quentin, Petofi should be dead soon, because I’ve sent King Johnny after him. Maybe you should go and try to keep Aristede from coming back at the last possible minute. Danny: Because Barnabas isn’t on the show today. 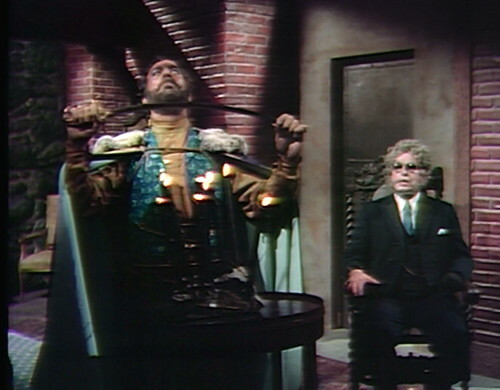 Stephen: And this is why it switches to where Petofi is clearly our hero, because he’s Batman, at the end of an episode cliffhanger, and Barnabas is the Riddler. He sets the trap in motion, and then says, I have to leave now. So Aristede Robin is able to come in and help. Danny: So Barnabas doesn’t see his own plan through. Stephen: And it’s never discussed again. At the end of the episode, he’s expecting King Johnny to come back with the Hand to cure Quentin. 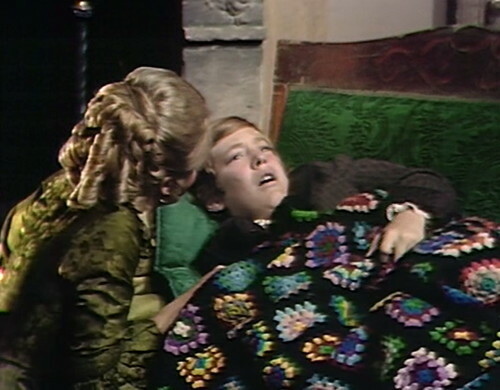 But there isn’t a “Barnabas is disappointed” scene, because that’s not the rhythm of the show anymore. We don’t do what we did two years ago, where there’s a Friday cliffhanger, and then there’s a whole week of discussing it, and everyone catching up on what’s happening. We’re not going to waste valuable real estate on that anymore. Danny: And once you’ve watched Dark Shadows for a while, you just understand the six-character limit, and you adjust your expectations without really thinking about it. When I was watching this for the first time back in high school, I was super aware of that. I’d hear Grayson Hall doing the opening narration, and I’d say, hooray, Julia’s going to be in this episode. Danny: Except the one person he’s supposed to have chemistry with, yeah. Stephen: Yeah, with Beth, he does about 80 percent of it, you can see him doing all the heavy lifting. But with Angelique, it’s just electric. Danny: One thing that’s odd about 1897 — because I totally agree, she and Selby are awesome together — but I think this is their third try at doing Quentin and Angelique. They get together like this for a minute, and then the show forgets about her. Danny: And why are we doing this again? Stephen: They’re basically saying, look, we know. Stick with us this time. But it’s wonderful that this isn’t about Barnabas, because it gives her a chance to do something new. 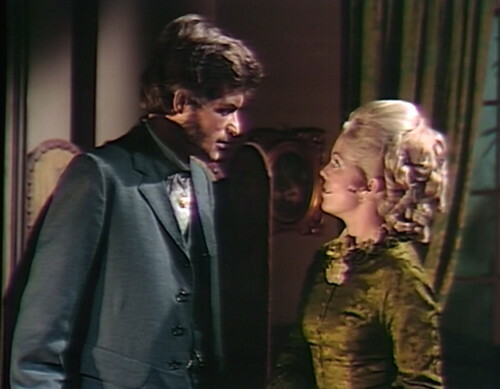 She agrees to help Barnabas later, but it’s because Petofi is threatening her relationship with Quentin. Everything is about Quentin now — as you say, Stand Next to Barnabas becomes Stand Next to Quentin, and Angelique knows that, and she takes steps. So this arc with Angelique is one of my favorites, because I think it’s the period where she makes the most sense as a character. Danny: Well, it’s been awesome watching this with you today. Thank you for doing this. Stephen: Yeah, this was great! Danny: So stay tuned, because after this, you get the vision of your own death. Stephen: Or I might get yours. Danny: Oh, right. I tell you what, if you see my death, will you give me a heads up? Cause I really want to get to Parallel Time, so if I’m going to die soon, then I need to pick up the pace on this. Tomorrow: Things That Happen When Count Petofi Isn’t Around. When Angelique tells Quentin, “Yes, I was there,” you can hear a floorboard creak as someone steps on it. 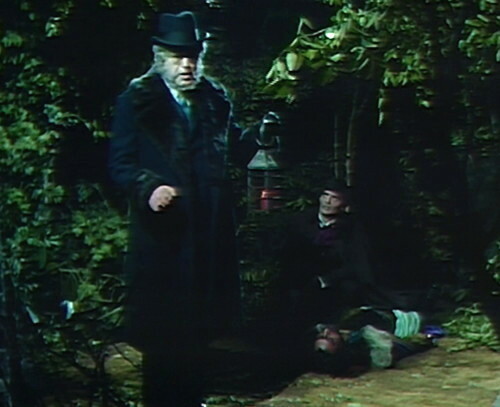 As Aristede announces to Petofi that he’s done burying Johnny, he coughs. The colorful afghan appears again today, covering up Jamison on the sofa. We last saw it a few weeks ago, wrapped around Lenore’s crib. Ah! Thank you. I’ll correct that. I’m grateful you stuck around, as well. 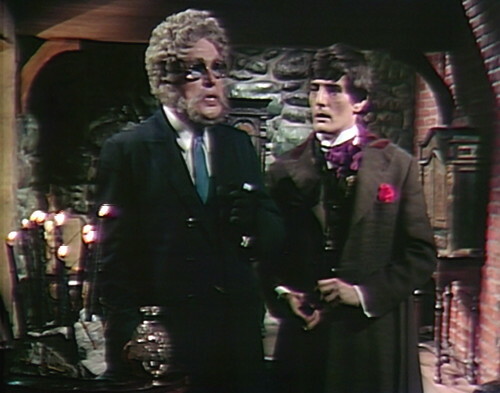 I might be wrong about this…but I think the first run of Dark Shadows on SciFi started with the Barnabas episodes, and the second run (after they’d completed the show) had the first episodes. I have only the words of fellow fans (from a DS newsgroup in the late 1990s) to back that up though. I started college in 1992, when the Sci-Fi Channel debuted, and the first run started with Episode 1, which was good for me because I had class at 11 a.m. when the show aired. 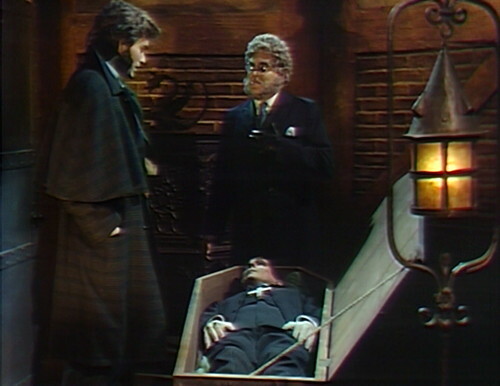 I recall watching the tail end of the early Barnabas storyline (Woodard’s death to 1795) during spring quarter of 1993, which would fit with the twice daily schedule. They then brought DS back in 1999, again starting with the Barnabas episodes, and I recall taping onto VHS 1897 when it started the next year. You are correct. I recall the newsgroup got excited about watching it from the very beginning. The 1795 storyline managed to skirt the race issue very nicely. But think of it. Andre du Pres is a planter in Martinique, who uses slaves to produce his wealth, and works them to death. He has business with a shipping family, the Collinses. Care to guess that the Collinses supplied him with? They did not call it the triangular trade fr nothing. Originally, the idea was to have the Collinses be haunted as punishment for their participation in the slave trade, but that was more reality than the public was willing to stomach these days, so they had to bring in witches and warlocks with ill defined agenda. 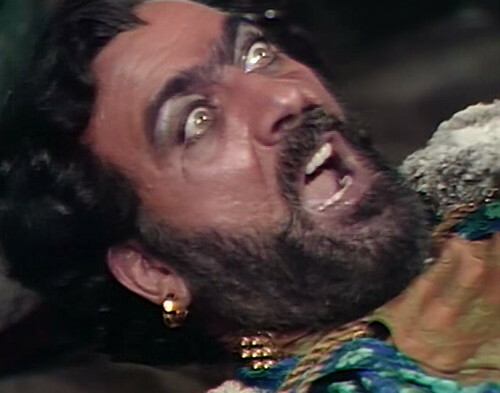 Of course, if we are talking about the slave trade, Barnabas being a vampire does make sense. What did he think he was doing all those years as the Collins heir? Did Art Wallace’s series “bible” say the Collinses were cursed for being slavers? I know this was in the Marilyn Ross books. 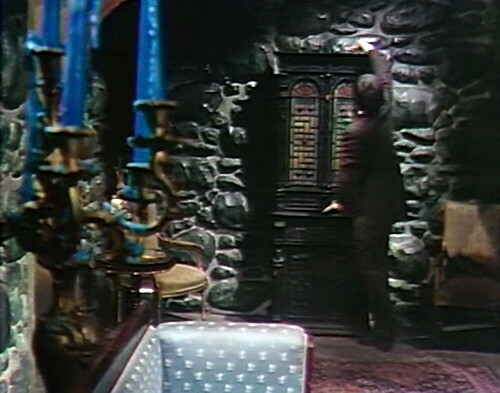 The producer and writers adhered closely to Shadows on the Wall mainly for the first year and practically not at all once the Barnabas story took off. Any implied issues of race are the product of subsequent revisions to the original story. There is no connection to the West Indies or its plantation owners, but to Europe. The “Collins House” chapter begins as follows: “In 1830, Jeremiah Collins, a sixth generation descendant of the founders of Collinsport, shocked his family and the community by returning from Europe with a French bride.” Wallace goes on to mention that: “Josette Collins found she was an alien in a hostile land. Shunned by Jeremiah’s family, hated by the community, her life was tormented by increasing loneliness.” The Art Wallace version of Josette has no servant from Martinique, no plantation owning father, no countess for an aunt — in fact, nothing of Josette’s family background is mentioned at all. All we know about her is that she is French, and that she and Jeremiah met and married in Europe. In the original blueprint of the show, the only curse that was brought upon the family involved Roger, who had Burke Devlin sent to prison for a crime that he himself committed, with the ever lingering scandalous possibility of the truth being at last revealed should Devlin return to Collinsport demanding justice. 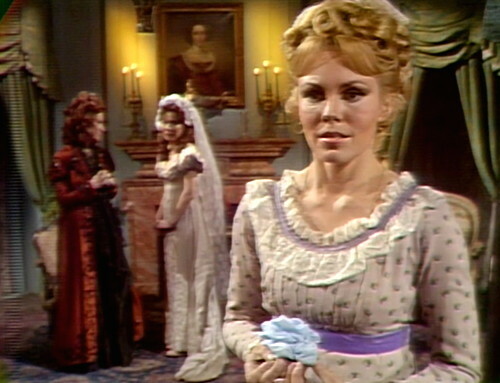 In the early pre-Barnabas episodes, it was established that the Collins’ family fortune had originally been based on the whaling industry. Joe once made a joke about how they had started out with whales and now relied upon sardines. I haven’t read the part about the actual episode yet because I’m fascinated with when did you start to watch this? and it’s funny about Buffy I guess. even in the olden days most shows – not dark shadows – got into syndication eventually and actually that is when I recently started watching The Good Wife, in reruns, on whatever local independent channel is running it. With the pilot. and then I watched 4 episodes, discovered I missed two episodes, finally got those from somewhere, and then my DVR died. on Halloween. so then I went to the library and got DVDs which were damaged in all the crucial points. whenever something crucial was happening the disc would stick. and I got all the way thru season 6 and now season 7 has 14 episodes and I don’t… Anyway, just when I decided that I wanted to start watching Buffy, it started that fall in syndication or actually specifically on FX and eventually they ran the episodes twice a day too. I saw dark shadows in 69 when it was big and everyone was watching it until my father made me stop. And then I joined a group that was doing stories based on it and I had no background. and then I read Judy Phillips episode summaries – they were just by her but they’re her archives or whatever. and then I really wanted to see it – and it was like 1999 – and sci-fi started running it. & I wanted them to start at the beginning. I like Vicky. it ended up that a friend of mine taped it for me – almost the entire series as a friend of hers had taped it for her – the entire series – back when she didn’t have Syfy. voice recognition is making these spelling choices. I’m trying not to lose the post. so sci-fi, back when they were spelled differently, or the way It decided to spell it this time – ran it twice. I always got the impression that Angelique was pretty much the Dupres’ indentured servant. Indentured servitude in Europe and the Americas was quite common at the time, and they could be of any race — not just black. And if she spent a lot of time in Martinique — perhaps growing up there — then it’s not too surprising she might become familiar with voodoo. Speaking of Martinique, I visited there on a cruise around 12 years ago. I now have a “trick question” I occasionally use as an ice-breaker at parties: “I’ve been to France, but I’ve never been to Europe. How can this be?” It’s because Martinique is considered part of France in much the same way as Hawaii is part of the United States. If you’ve been to Martinique, then legally you’ve been to France. Seeing Petofi and Ariside bury King Johnny in the woods, made me wonder, how many bodies are buried on the grounds? Every time someone dies, they bury them in the woods. It must be getting hard to find a good spot. Did I miss an ep somewhere? At what point did Angelque break off the engagement? I skipped ahead, cuz the library didn’t have it. I would like to know, tho. I believe when she failed to fix Quentin’s face, there was no engagement. That’s why she’s demanding now that he marry her whether she succeeds or fails. 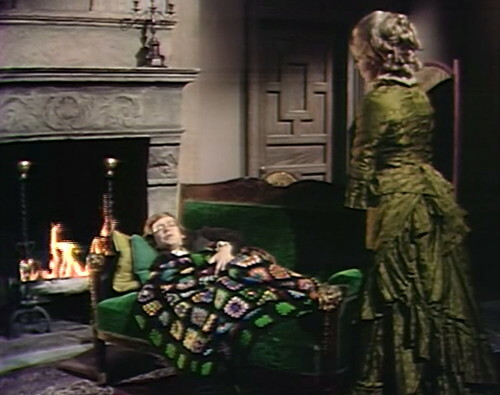 Just an addendum on the Collinsport afghan: It covered Jamison/David for an episode or two before this one as well, so we’ve seen it since Lenore.